LEADER Group launches new website to represent its rebranding of the LEADER, BIOex and the new aquired Tempest Technology. A major player in its market for decades, LEADER develops, manufactures and supplies firefighting equipment, search and rescue equipment and training equipment to support professionals in these sectors (firefighters, public safety, USAR teams, trainers, etc.) in order to protect people and assets worldwide. With a strong national presence, LEADER is one of the top search and rescue and firefighting equipment supplier in France. Also having a significant international presence, LEADER is also one of the leading providers of search and rescue and firefighter equipment worldwide. 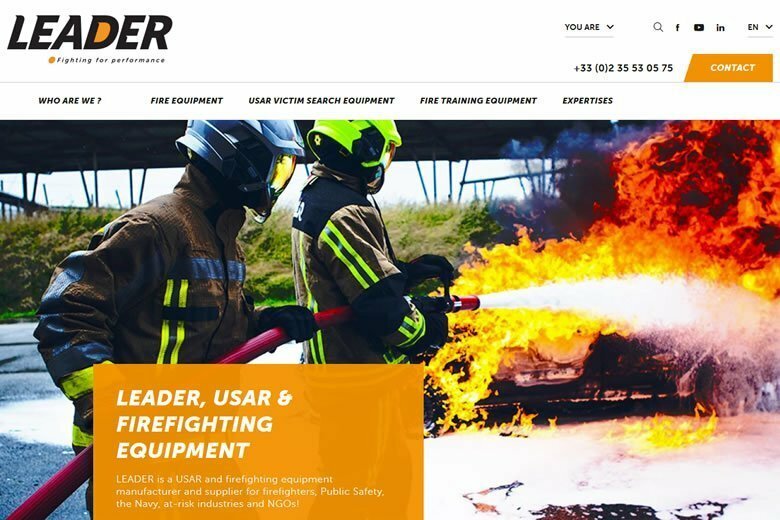 LEADER offers its customers high-tech, strong and reliable firefighting material and search and rescue equipment in all circumstances, to protect and rescue people and assets. The company develops innovative equipment adapted to usage in the field, to help and protect rescue teams during their day-to-day missions. Firefighting blower fans, firefighting nozzles, fire monitors, thermal imaging cameras, foam and foam making equipment (polymousse), fire hoses, search and rescue equipment (e.g. victim search apparatus, life detectors and search cameras), forcible entry and USAR equipment, stability monitors, lights, fire training simulators, training extinguishers, smoke generators and ATEX equipment…are just some of the SAR and firefighting material ranges sold by LEADER in over 80 countries. To ensure optimal use of the equipment it supplies, LEADER supports its customers by offering training adapted to each individual circumstance, and also provides equipment maintenance.